There are two reasons that attic ventilating is critical to your home. In the summer the attic contains very hot air that is a result of the suns energy. This heat radiates through the floor of the attic into your home, which increases the costs of energy to maintain a cool atmosphere within the home. As well, if the ceiling does not have a continuous vapor barrier installed, excess moisture will enter the attic, which, if not removed can cause structural damage to roof rafters and the ceiling of living space below the attic. Hence, maintaining proper moisture and temperature levels within the attic space is critical. Both moisture control and air temperature is controlled by proper attic ventilation. There are numerous methods that can be used to provide proper ventilation to your attic space. Which is chosen is usually predicated upon the roof construction, style and materials. 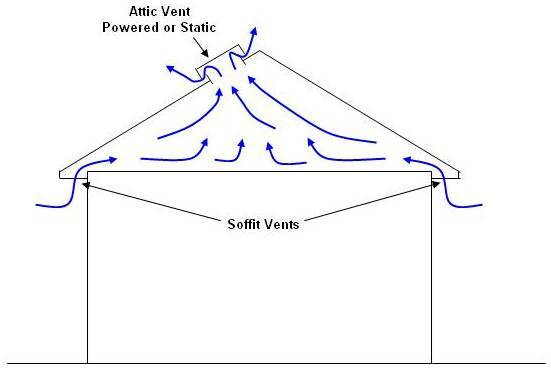 The most common method of ventilation employees static vents in the soffits and manual and/or powered attic vents close to the ridge of the roof, as shown in Figure 1. 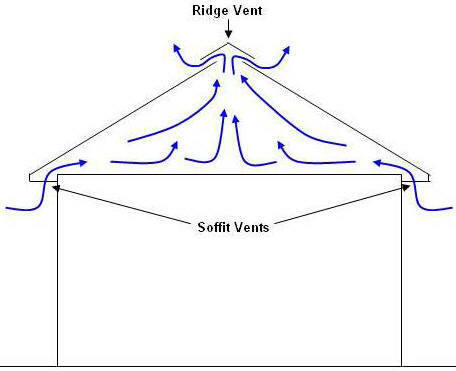 In this case because of natural air flow (hot air rises) or in the case of a powered vent unit the hot air is expelled near the top of the roof and fresh air is drawn in from the vents in the soffit. A common variation is to replace the roof vent with a ridge vent that runs the total length of the ridge. In a similar manner to having air vents mounted close to the ridge of the roof, a ridge vent expels all of the hot air in the attic which is then replaced with fresh air through the soffit vents. For homes that have straight gables it is possible to provide adequate attic ventilation without working on the surface of the roof. 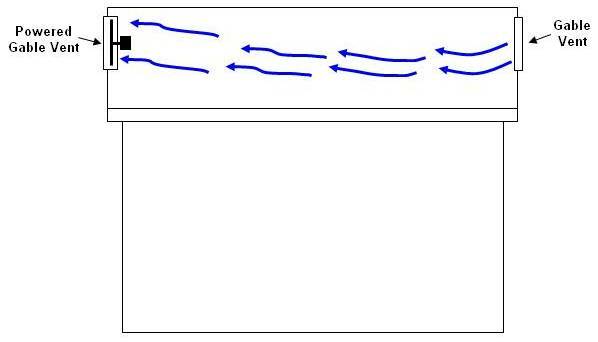 One gable has a vent grill while the other gable is equipped with a powered gable fan , as shown in Figure 3A, As hot air is expelled by the powered gable vent, fresh air is brought into the attic at the opposite end of the home. There are many variations, combinations and hardware that can be employed to provide proper attic ventilation. In many cases it would be advantageous to use a powered attic fan only to discover that obtaining power for the attic fan is a very difficult exercise. 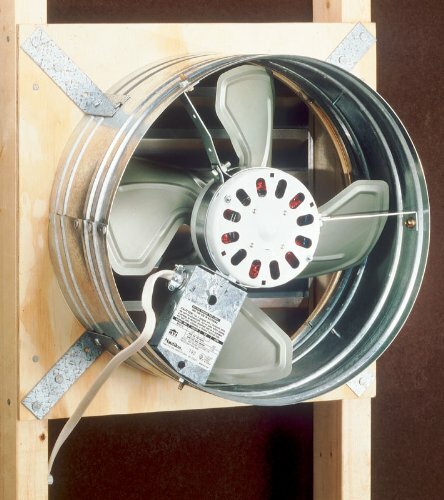 Advances in solar cell technology have made the use of solar powered attic ventilation fans , as shown in Figure 4, a reliable alternative to standard power. Besides the ease of installation, solar powered attic fans are a onetime expense, unlike AC powered fans that you pay for every month on your electric bill. 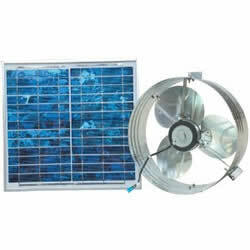 If obtaining power in your attic to power an attic ventilation fan is a problem or if you do not want to pay for attic ventilation forever, consider using a solar powered attic ventilation fan.